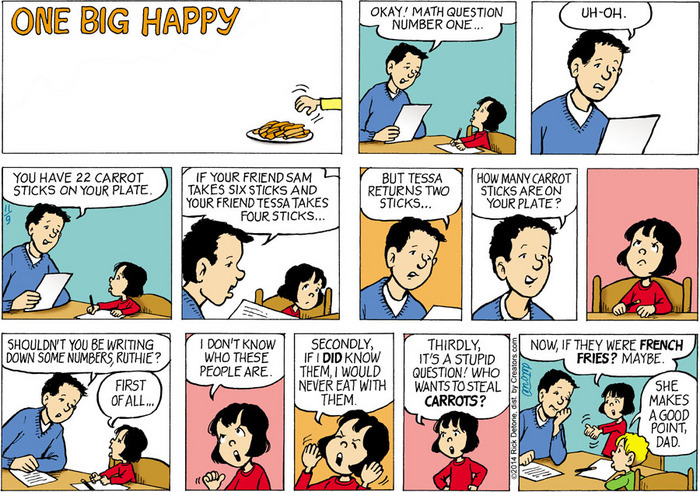 I knew if I kept going long enough some cartoonist not on Gocomics.com would have to mention mathematics. That finally happened with one from Comics Kingdom, and then one from the slightly freak case of Rick Detorie’s One Big Happy . Detorie’s strip is on Gocomics.com, but a rerun from several years ago. He has a different one that runs on the normal daily pages. This is for sound economic reasons: actual newspapers pay much better than the online groupings of them (considering how cheap Comics Kingdom and Gocomics are for subscribers I’m not surprised) so he doesn’t want his current strips run on Gocomics.com. As for why his current strips do appear on, for example, the fairly good online comics page of AZcentral.com, that’s a good question, and one that deserves a full answer. Vic Lee’s Pardon My Planet for the 6th of November, 2014. Vic Lee’s Pardon My Planet (November 9),	which broke the streak of Comics Kingdom not making it into these pages, builds around a quote from Einstein I never heard of before but which sounds like the sort of vaguely inspirational message that naturally attaches to famous names. The patient talks about the difficulty of finding something in “the middle of four-dimensional curved space-time”, although properly speaking it could be tricky finding anything within a bounded space, whether it’s curved or not. The generic mathematics problem you’d build from this would be to have some function whose maximum in a region you want to find (if you want the minimum, just multiply your function by minus one and then find the maximum of that), and there’s multiple ways to do that. One obvious way is the mathematical equivalent of getting to the top of a hill by starting from wherever you are and walking the steepest way uphill. Another way is to just amble around, picking your next direction at random, always taking directions that get you higher and usually but not always refusing directions that bring you lower. You can probably see some of the obvious problems with either approach, and this is why finding the spot you want can be harder than it sounds, even if it’s easy to get started looking. Reuben Bolling’s Super Fun-Pak Comix (November 6),	which is technically a rerun since the Super Fun-Pak Comix have been a longrunning feature in his Tom The Dancing Bug pages, is primarily a joke about the Heisenberg Uncertainty Principle, that there is a limit to what information one can know about the universe. This limit can be understood mathematically, though. The wave formulation of quantum mechanics describes everything there is to know about a system in terms of a function, called the state function and normally designated Ψ, the value of which can vary with location and time. Determining the location or the momentum or anything about the system is done by a process called “applying an operator to the state function”. An operator is a function that turns one function into another, which sounds like pretty sophisticated stuff until you learn that, like, “multiply this function by minus one” counts. In quantum mechanics anything that can be observed has its own operator, normally a bit tricker than just “multiply this function by minus one” (although some are not very much harder! ), and applying that operator to the state function is the mathematical representation of making that observation. If you want to observe two distinct things, such as location and momentum, that’s a matter of applying the operator for the first thing to your state function, and then taking the result of that and applying the operator for the second thing to it. And here’s where it gets really interesting: it doesn’t have to, but it can depend what order you do this in, so that you get different results applying the first operator and then the second from what you get applying the second operator and then the first. The operators for location and momentum are such a pair, and the result is that we can’t know to arbitrary precision both at once. But there are pairs of operators for which it doesn’t make a difference. You could, for example, know both the momentum and the electrical charge of Scott Baio simultaneously to as great a precision as your Scott-Baio-momentum-and-electrical-charge-determination needs are, and the mathematics will back you up on that. Ruben Bolling’s Tom The Dancing Bug (November 6),	meanwhile, was a rerun from a few years back when it looked like the Large Hadron Collider might never get to working and the glitches started seeming absurd, as if an enormous project involving thousands of people and millions of parts could ever suffer annoying setbacks because not everything was perfectly right the first time around. There was an amusing notion going around, illustrated by Bolling nicely enough, that perhaps the results of the Large Hadron Collider would be so disastrous somehow that the universe would in a fit of teleological outrage prevent its successful completion. It’s still a funny idea, and a good one for science fiction stories: Isaac Asimov used the idea in a short story dubbed “Thiotimoline and the Space Age”, published 1959, which resulted in the attempts to manipulate a compound which dissolves before it adds water might have accidentally sent hurricanes Carol, Edna, and Diane into New England in 1954 and 1955. Chip Sansom’s The Born Loser (November 7)	gives me a bit of a writing break by just being a pun strip that you can save for next March 14. Dan Thompson’s Brevity (November 7),	out of reruns, is another pun strip, though with giant monsters. Francesco Marciuliano’s Medium Large (November 7)	is about two of the fads of the early 80s, those of turning everything into a breakfast cereal somehow and that of playing with Rubik’s Cubes. Rubik’s Cubes have long been loved by a certain streak of mathematicians because they are a nice tangible representation of group theory — the study of things that can do things that look like addition without necessarily being numbers — that’s more interesting than just picking up a square and rotating it one, two, three, or four quarter-turns. I still think it’s easier to just peel the stickers off (and yet, the die-hard Rubik’s Cube Popularizer can point out there’s good questions about polarity you can represent by working out the rules of how to peel off only some stickers and put them back on without being detected). Rick Detorie’s One Big Happy for the 9th of November, 2014. Rick Detorie’s One Big Happy (November 9),	and I’m sorry, readers about a month in the future from now, because that link’s almost certainly expired, is another entry in the subject of word problems resisted because the thing used to make the problem seem less abstract has connotations that the student doesn’t like. Fred Wagner’s Animal Crackers (November 9)	is your rare comic that could be used to teach positional notation, although when you actually pay attention you realize it doesn’t actually require that. Mac and Bill King’s Magic In A Minute (November 9)	shows off a mathematically-based slight-of-hand trick, describing a way to make it look like you’re reading your partner-monkey’s mind. This is probably a nice prealgebra problem to work out just why it works. You could also consider this a toe-step into the problem of encoding messages, finding a way to send information about something in a way that the original information can be recovered, although obviously this particular method isn’t terribly secure for more than a quick bit of stage magic.